GAINESVILLE, FL: The student Alpha Pi Mu chapter of the Department of Industrial & Systems Engineering won second place for the national “outstanding chapter” competition for 2011. 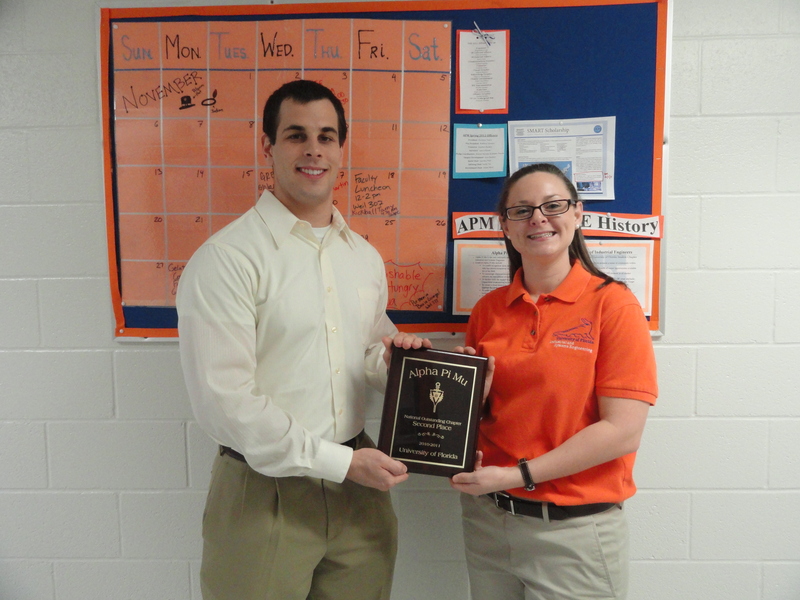 According to the APM national website, the competition “is based on an evaluation of the chapter’s activities in three categories: chapter and university activities; betterment of the field ofIndustrial Engineering; and betterment of the national society.” Elizabeth Gillett and Todd Goldberg served as APM Student Chapter Presidents from 2010 to 2011. During their leadership, the APM student chapter’s involvement in university and the ISE department’s activities increased substantially, which ultimately resulted in chapter’s accomplishment of placing second. Alpha Pi Mu is the national honor society for Industrial Engineering.